What better way to kick-off the year of 1991 then with one of the greatest hip-hop groups of all time? Gang Starr released their debut album No More Mr. Nice Guy , in 1989. And while the album was meh at best, Guru and Premo showed enough potential to keep heads interested in taking a listen two their sophomore effort Step In The Arena a few years later. Step In The Arena may have the most generic album cover artwork of all time. The title looks like it was scribbled by a 1st grader. And if that’s not bad enough, the low-budget pic of Guru and Premo has them both looking like broke bums instead of a future legendary hip-hop duo. Name Tag (Premier & The Guru) – A smooth piano sample plays as a Guru vocal sample reminds the listener who the members of Gang Starr are. Step In The Arena – This title song was the fourth and final single released from the album. I’ve never cared much for this song. Premier’s squeaky sample is boring and borderline annoying, which really makes it difficult to focus on Guru’s flow, whose monotone delivery can be a challenge to follow in and of itself . Form Of Intellect – This is a step back in the right direction. Premo provides a simple guitar sample that serves as the perfect backdrop for Guru’s monotone flow. Guru is not often mentioned when discussing greatest emcees but this one definitely displays some of his lyrical dexterity . Execution Of A Chump (No More Mr. Nice Guy Pt 2) – I’ll start off by saying part two runs lapses around the original (which is on No More Mr. Nice Guy ). Premo whips up a mid tempo instrumental for Guru to send threats to a friend that tried to play him, and in the following verses, anyone else who fronts on the Gifted Unlimited Rhymes Universal. Well done, gentlemen. Who’s Gonna Take The Weight? – This is one of Premo’s sickest instrumentals of all time, which is saying a lot considering Premo’s healthy catalog of gems. Premo samples a Maceo Parker saxophone snippet that will completely mess your head up when you hear what sounds like a siren, drop on the beat. Then to add insult to injury, before the songs fades out Premo scratches the life out of the same sample to ensure your left with a severe brain freeze. Guru does a good job handling Premo banger but there is no question Premo’s instrumental is the star of this one. Beyond Comprehension – Not one of my favorite Premo beats or Gang Starr songs. It just feels like its missing something. Like a heart. Check The Technique – Now this is more like it. Years before Dodge and Dockers resurrected Marlena Shaw’s 1969 record “California Soul” to push their product in commercials, Premo borrowed it to create the backdrop for this classic Gang Starr song. Over rough drums and triumphant violins Guru peacefully builds on this track with each lyric until his pyramid is complete. This is one of Gang Starr finest moments. Love Sick – This was another single released from Step In The Arena . Over a melancholy Premo backdrop Guru clearly needs of a hug as he sadly recalls the events that led up to he and his lady’s breakup. Guru’s natural monotone sounds great over this instrumental and with the songs overall mood and subject matter. This is the proper way to make a hip-hop love song: soft and vulnerable without coming across corny. Here Today, Gone Tomorrow – Guru spits two quick verses, sending a few words of wisdom about longevity in this here rap game. Based on the man’s catalog, I’d say he’s qualified to speak on the topic. Take A Rest – Guru’s in battle mode, but apparently Premo didn’t get the memo. His instrumental isn’t nearly aggressive enough to carrier battle rhymes. What You Want This Time? – Guru dedicates this one to the groupies that’s can’t take a hint. Premo’s instrumental uses the same sample used a year earlier on BDP’s record “The Racist”. I like the ringing telephone sample Premo adds in at the beginning of the song to set up Guru’s opening verse. Guru turns in one of his best performances of the album on this one: his verses are precise, colorful, and detailed. Nice. Street Ministry – Over a beautiful laid back jazz tinged Premo instrumental Guru uses one verse to wax poetic, leaving a few jewels for the listener to marinate on. Just To Get A Rep – Hip-hop classic. Easily one of the greatest Gang Starr songs in their heavily stacked catalog. Guru uses Premo’s simple but addictive instrumental to spit two verses about a stick up kid and the reasons he does his dirt. I still remember the video for this song, which actually adds a third verse where the victim from the second verse comes back seeking revenge on his perpetrator. It’s worth checking for after you listen to the original mix. Say Your Prayers – Guru continues his street ministry, spitting a quick one verse sermon for you to chew on over a dark and eerie Premo instrumental. As I Read My S-A – This may be the corniest song title in all of Gang Starr’s catalog. But it literally plays like it reads (no pun intended). Premo provides a decent instrumental but the song still feels like it’s missing a soul. Precisely The Right Rhymes – I completely forgot about this song. Like “Take A Rest” Guru’s in battle mode over another track that doesn’t quite fit the mood of his rhymes. I do love the guitar sample Premo sprinkles throughout the instrumental, though. The Meaning Of The Name – It’s only right that Premo ends the evening with his trademark boom-bap. This one has a dark feel and sounds even better when listened to after midnight. Guru spends two verses to explain what the title states (which apparently has quite a few different meanings), and though he strays from the subject a few times, he manages to stay focused for the most part. Nice way to end the show. On “Form Of Intellect” Guru mentions that it only took them two weeks to create No More Mr. Nice Guy . This should come as no surprise as the majority of the debut sounds rushed and incomplete (especially Guru’s rhymes). Oh what a difference two years makes. Premo and Guru obviously spent more time creating Step In The Arena as Premo’s instrumentals have gotten sicker, and Guru seems to have found his lane as a viable emcee. There are a few underwhelming moments on Step In The Arena but those moments are far and in between. 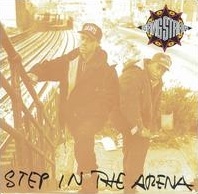 Step In The Arena is a good album and a prelude to their next three albums that would define and secure the Gang Starr’s legacy. This album made me follow gangstarr’s career. At the time it was released there was nothing like it. Nothing. You can not be serious right now. Those “underwhelming” songs are all pretty solid. The title song is one of their best songs and Guru spits some of his best rhymes on this. Beyond Comprehension has a quiet instrumental, but it’s pretty solid when you get to it. Take A Rest is probably one of my favorite songs from them. I don’t get what you don’t feel about that. And As I Read My S-A has a sick instrumental. That title is corny though.